St Melangell's story begins as a familiar one. She was a 7th-century Irish princess who had dedicated her life to prayer. Her father, the king, had arranged for her to marry against her will. Wishing to preserve her life of virginity and prayer, in about the year 590 she fled Ireland and settled in the countryside of what is today North Wales. There she lived a life of solitude and prayer. While hunting one day nearly fifteen years later, in the year 604, Brochwel Ysgithrog, then Prince of Powys and Earl of Chester, encountered the young Melangell, when the hare that his hounds were chasing took refuge under her cloak. Seeing her, the hounds stopped. Brochwel tried to command them to go on but Melangell defied them and they turned and fled. Brochwel had never experienced anything like this, and was keen to speak to the mysterious young woman. Struck by her beauty, he had hoped that she would marry him, but when he heard her story he was so moved and impressed by her determination and piety that he donated to her a parcel of land in the valley where she could live her monastic life among the wild creatures there. News of her spread throughout the area and other women came to gather around her, forming a community there. They ordered their communal life on prayer and works of mercy, providing sanctuary to the poor and needy, protecting them from their creditors and persecutors. 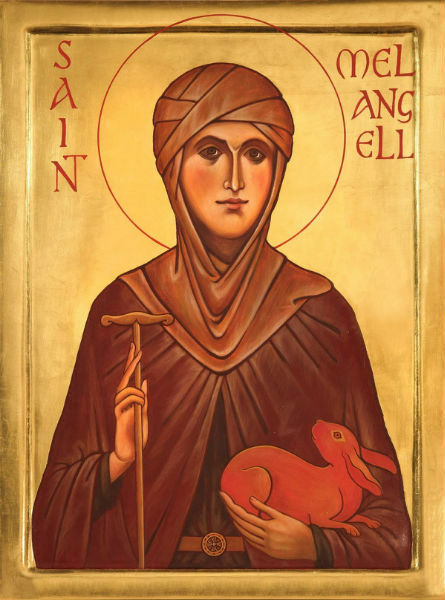 Melangell was the mother to this community of women for the remaining 37 years of her life, and was often seen surrounded by hares during this time. After Melangell's death, her tomb became a place of healing, with pilgrims travelling for miles to venerate her relics and ask her intercession. Brochwel's successors decreed that the area must be protected as a place of solace for those in need of healing and restoration, as well as a place of refuge for the small animals, who were to remain unharmed. So it remained for centuries. However, at the Reformation, the site was desecrated. The holy shrine was destroyed and the stones were scattered in the churchyard, with some incorporated into walls and other structures. The pious local people hid the relics so that the desecrators could not destroy them, but in time, any memory of their location died. By the late 20th century, the church was in such a state of disrepair that serious renovation work was required to save it. It was during this work that bones were discovered hidden in the fabric of the church. These were found to be those of a woman, dating from the 6th or 7th century. The shrine was reconstructed from the reclaimed stones around the churchyard, and the relics were enshrined once more. 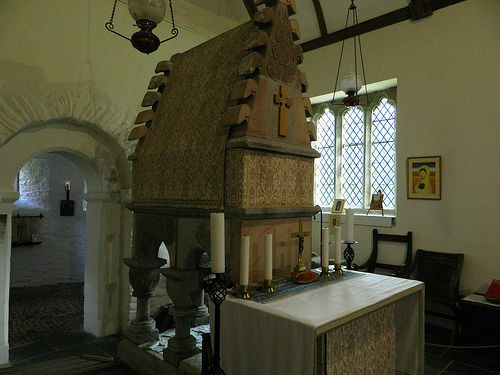 The little church at Pennant Melangell has again become a place of pilgrimage and once more St Melangell is venerated there, as a model of piety and protectress of animals. shines in the starry realms of light. she walked along the heav'nly way. for which she left the joys of this. with psalms, and hymns, and melody. in mercy hear your people's cry! from age to age, eternally. Amen. In addition to our primary patron saint, we also have a devotion to the Holy Myrrhbearers. The Myrrhbearers are those holy women who came to the tomb of Christ early on Easter morning to find it empty. Their story is inseparably linked to the passion, death, and Resurrection of Jesus Christ. These women were disciples of the Saviour during his earthly ministry in Galilee, providing for Him and his other followers out of their own means (Mark 15:41). They remained faithful to Him even during the most dangerous time of his arrest and crucifixion, and not only stood by the Cross, but accompanied Him to his burial, noticing where the tomb was located. At a time when association with Jesus carried with it immense danger of arrest and execution, these women showed extreme bravery in going to anoint the body of the Saviour, thus overturning the constraints that the expectations of religion and society had placed on their gender in order to show reverence and love for their Lord. Because of the impending Sabbath, it was necessary for the burial preparations to be brief. Jewish custom at the time dictated that mourners return to the tomb every day for three days. 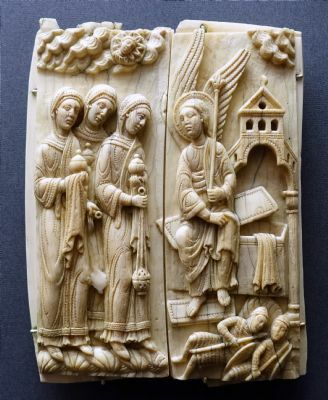 Once the Sabbath had passed, the women returned at the earliest possible moment, bringing myrrh to anoint the body, in fulfilment of the symbolic offering of myrrh by the Wise Men, which was a foretelling of the Saviour's death. It was at the tomb that the Resurrection was revealed to the women, and they were told by the angel to proclaim the good news to the Apostles. They were, in effect, the apostles to the Apostles. 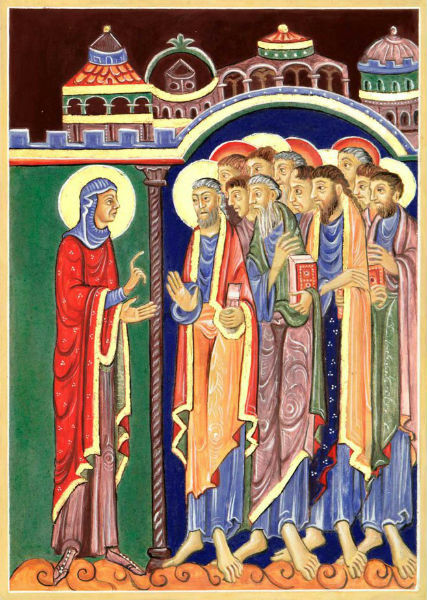 For this reason, the Holy Myrrh-bearing Women are referred to in the Church's hymnody and prayers as "Equals of the Apostles". Sometimes also numbered among the Myrrhbearers are St Joseph of Arimathaea and St Nicodemus, who took the body of Jesus down from the Cross, embalmed it with myrrh and aloes, wrapped it in clean linen, and placed it in a new tomb. (Matthew 27: 55-61, Matthew 28: 1-10, Mark 15: 40-16: 11, Luke 23: 50-24: 10, John 19: 38-20: 18). ​For their witness of love and complete devotion to the Saviour, for their bravery in giving honour to the Saviour in spite of personal danger, and for their example of refusing to allow the oppressive expectations of society and the religious establishment to prevent them from doing what was right, we honour the memory of the Holy Myrrhbearers. Through their intercessions may we be strengthened to follow in their footsteps, and remain faithful to Christ in our own lives.